Pompey, Caesar, Cicero, Brutus, Antony: the names resonate across thousands of years. Major figures in the civil wars that brutally ended the Roman republic, their lives still haunt us as examples of how the hunger for personal power can overwhelm collective politics, how the exaltation of the military can corrode civilian authority, and how the best intentions can lead to disastrous consequences. Plutarch renders these history-making lives as flesh-and-blood characters, often by deftly marshalling small details such as the care Brutus exercised in his use of money or the disdain Caesar felt for the lofty eloquence of Cicero. Plutarch was a Greek intellectual who lived roughly 100 years after the age of Caesar. At home in the world of Roman power, he preferred to live in the past, among the great figures of Greek and Roman history. He intended his biographical profiles to be mirrors of character that readers could use to inspire their own values and behavior - emulating virtues and rejecting flaws. For Plutarch, character was destiny for both the individual and the republic. He was our first master of the biographical form, a major source for Shakespeare and Gibbon. This edition features a new translation by Pamela Mensch that lends a brilliant clarity to Plutarch's prose. James Romm's notes guide listeners gracefully through the people, places, and events named in the profiles. 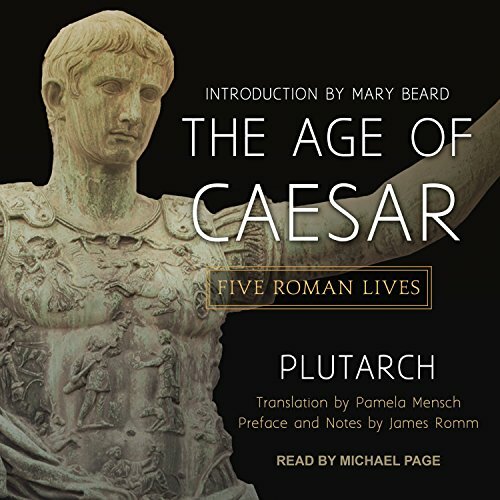 And Romm's preface, along with Mary Beard's introduction, provide the perfect frame for understanding Plutarch and the momentous history he narrates.